Although considered “politically incorrect” in some circles, I use the term weapon here because I feel it is the most accurate. Besides being a dedicated competitive shooter I have also been a police officer nearly all of my adult life. In all of my training, both physical and mental, I’ve always tried to maintain as much realism as possible. (I am proud to say that the Glock 35 I use as a duty pistol is the exact same one I used to win my 1st National Championship with) Competitive shooting (IDPA, IPSC, USPSA) is a game first and foremost, and for many people that is all it is. However, in its roots and at its core lie many of the skills (again both physical & mental) needed by those who sometimes must go into harms way. I’ve often thought that the ultimate in this regard would be someone with the combined skills of a top ranked IPSC Grandmaster and that of someone truly skilled in combat. 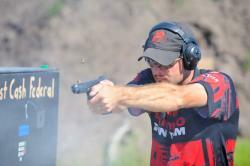 Since the beginning of 2006 I have shot Glock pistols exclusively in competition. 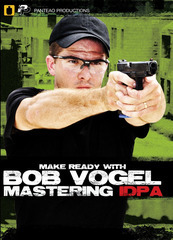 Prior to this I had shot 1911 style pistols (STI) for three solid years. My number one reason for preferring the Glock is the grip I am able to get on the pistol. Because of the grip angle, ergonomics and low bore axis of the pistol I can get a much higher and more secure grip with both hands. This in effect translates into a shooting platform that is more effective in controlling recoil. For me the trigger on a Glock is actually a plus. With the double action type trigger it allows for more of a “surprise break” type shot. This has allowed me to shoot more aggressively and has made trigger freeze less of an issue. I will admit that before switching to Glocks I had to set aside a number of preconceived notions that I had about them. This was easily done by concentrating on the only thing that really mattered to me: The results. Glock 34 Vogel Dynamics sights (FO front); 147gr bullets loaded to135PF; Safariland 5189 holster. 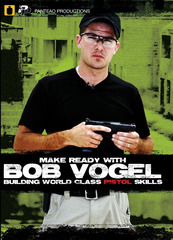 Glock 17 Vogel Dynamics sights (FO front); 147gr bullets loaded to 135PF; Safariland 5189 holster. Glock 21SF Vogel Dynamics sights (FO front), 230gr bullets loaded to 170-175PF; Safariland 5189 holster. Glock 24 Seattle Slug Plug;Vogel Dynamics sights (FO front); TTI basepads; 200gr bullets loaded to 170PF; Safariland 014 Competition holster and Safariland mag pouches. Glock 17 KKM barrel; SJC Major Compensator; J-point/Doctor slide mounted optics; Dawson Ice Magwell; TTI basepads; Safariland 014 Competition holster and Safariland mag pouches.